Call 303-234-1727 or stop by our showroom! Contact us for a bid! Let’s face it, bare windows are rarely the best choice when decorating a room. Window treatments, whether pleated, puddled, or plain, add softness to the hard edges of a room. In terms of common sense, they add privacy and light control. They also can help conceal a room’s flaws or emphasize its charms. To see some great options in window treatments for your home, talk with a trained consultant at Blinds & Designs serving San Francisco and Tiburon today. It’s a beautiful thing when passion and design come together. With simple tweaks to the décor of your space, such as simply updating your window treatments, you can easily add life and style to a room that was otherwise outdated. The three things to consider when selecting the perfect treatment are the fabric, texture, and pattern. But choosing the type of treatment your room needs is the first order of business. If you are looking for something luxurious but without yards of flowing fabric, a Roman shade would be a perfect choice. When closed, the shade is a flat fabric panel. When raised, the cascading horizontal folds have a clean, tidy look. A Roman shade can be mounted inside or outside a window frame. Though the shade is often used alone, it can be the practical layer combined with side panels or a valance. For Roman shade ideas, consider the Vignette® Modern Roman Shades or the Design Studio™ Roman Shades by Hunter Douglas. These Roman shades are both child- and pet-safe and offer a large selection of fabrics and designs. Sheer shading has grown in popularity over the years. This type of window treatment includes soft vertical vanes that seem to float in the window. The vanes are suspended by a sheer fabric. This type of treatment is formal and soft and works well with contemporary décor. 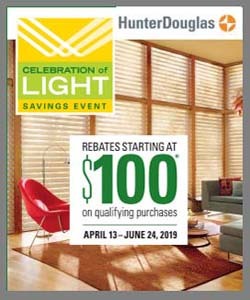 If you are considering this type of product, take a look at the sheer shades from Hunter Douglas called Silhouette® window shadings or Pirouette® window shadings, and for the bedrooms and home office, you may want to consider the Nantucket™ window shades, which are very cost-effective. Plantation shutters are fantastic—they’re clean, long-lasting window treatments. There are no cords, so they are safe for children and pets. They let in a lot of light when opened and provide “lights-out” darkness for a good night’s sleep. Also, shutters are easy to clean and do a great job of providing insulation from the outside cold and heat. They’re available in a number of paints and stains, so they can work in any décor well. Consider looking at the entire line of Hunter Douglas shutters, including Heritance® hardwood shutters, NewStyle® hybrid shutters, and Palm Beach™ Polysatin™ shutters. Wood and faux wood blinds will immediately enhance the beauty and overall appearance of any room in your home. In addition to improving the appearance of your windows and being highly effective at blocking light, both wood and faux wood window treatments also perfectly complement a wide variety of home décor and furnishings. Wood and faux wood blinds are durable, and they can provide a warm look to your home. Or, if you go with a cool white, your room will look bright, clean, and crisp. When you review the Hunter Douglas Parkland® wood blinds, take special note of the natural wood grains and textures. The same can be said of their faux wood EverWood® alternative Wood Blinds collection. Within this collection, you will also find the white and off-white blinds perfect for that clean, cottage look. Bretz Interiors is a family owned business located in Lakewood and serving the greater Denver area. In operation since 1959, we focus on delivering high quality products and exceptional service to every client. Our showroom has a wide variety of displays and our sales team is happy to assist you with any questions you may have! We serve residents and businesses in the Denver area including Arvada, Wheat Ridge, Lakewood, Golden, Westminster, Littleton, Morrison, and neighborhood of Applewood, CO. Contact us to learn more about our rebates and promotions or to schedule a free in-home design consultation today! "Very professional, knowledgeable, and friendly . Pat was excellent through the process choosing my new hardwood floors, and the installers were the best contractors I've ever dealt with. They even repaired some tile work that had not been installed by them. I'd definitely recommend Bretz to anyone!" ~ Prudence P.
Bretz Interiors is the premier Denver metro area provider of custom flooring and Hunter Douglas window coverings. We carry custom tile, stone, laminate, carpet and other flooring materials as well as custom blinds, shades, shutters and draperies for residents and businesses in Denver, Arvada, Wheat Ridge, Lakewood, Golden, Westminster, Littleton, Morrison, and the neighborhood of Applewood, CO. Contact us today at 303-234-1727 or visit our Lakewood, CO showroom!